...Home again, home again, jiggety-jig. A few weeks ago there was an anklebiter uprising and the weekend before last was declared a market-free zone. To set things back to right, the Mr and I put our conniving, cunning heads together and this weekend we visited two. Farmer’s Market at the Collingwood Children’s Farm. My kids love the place, even if the conditions were what I imagine a snowstorm to be minus snow. As well as those chickens with feather foot warmers, we saw a real and generously proportioned pig. Should you wish to buy, his organic cousin comes sausage-shaped. The Great Market Challenge: Part One. Inspired by the nursery rhyme, the first of these (ahem) weekly challenges, is to locate as many pigs as possible. Warthogs and flying pigs permissible. Degree of difficulty: 8.5 (Camberwell Market is a busy, buzzy place and only one of our number exceeds 153cm). Not bad, don’t you think? Especially given our search was limited to the main thoroughfare and fronts of stalls. The good news is, it turns out Camberwell Market pig farmers are exceedingly generous with their wares. We arrived home again, home again, jiggety-jig, with two piggy donations. This post was quite educational - I had no idea that there was plum-bun-buying in the original nursery rhyme. Well, there you go! I just love the pig-spotting. Brilliant idea. 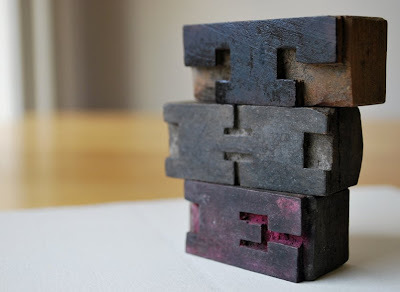 I'm also quite obsessed with the type you bought. 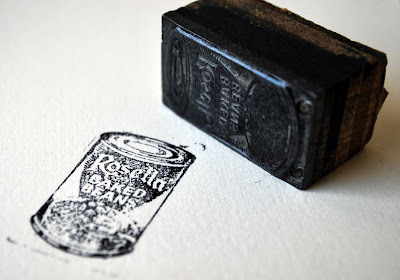 And that Rosella stamp!!! I'd so love to get some type. Was it from Camberwell Markets? Never been there. Thus endeth another rambling comment. so gorgeous... those stamps are brilliant! Great idea! That is a lot of pigs! Your finds are all wonderful. Especially the buttonets and the typography. Did they have more?! Clever, clever girl, coralling the anklebiters into pig-searchers (and successful ones at that!) Makes me want to take mine out on a similar expedition. Alas, they are less easily persuaded, being dreadfully jaded in their advanced years, so a nursery rhyme is unlikely to be adequate motivation. And here I was thinking that pigs might be a tad out of fashion with the whole swine flu thing. What fun you made with them. Must admit I was pretty happy to be having a break from doing markets (including Collingwood) when I saw what the weather was doing on the weekend. And well done on the conniving. Isn't it amazing how much brain power has to go into convincing younger folks that things are a good idea? I've gone all this time and never heard the second half of that nursery rhyme! How very cool! And, yippee for a little market conniving. Classy ending to an elegant post. (Bit like an Olympic-type dive really.) Verrrrrry nice. The feather foot warmer chickens are my absolute favourite. I say Hi to them everyday when I go to the farm cafe to get my morning coffee. 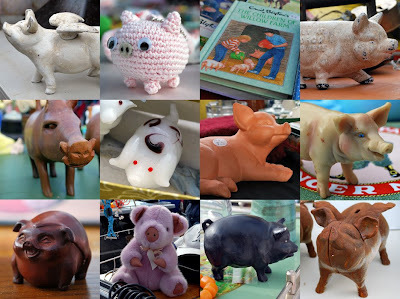 Love the pig game and love all the gorgeous treasure you found. I want to come on an outing with you. love your findings and that ending is awesome! Oh you're good. Well done - and you scored swines. Excellent. And thanks for the support with the 12-step book program I seem to have started. As a reader, you entertain me. As a mother, you inspire me. Oh the lengths we need to go to! Great finds at the camberwell market. I have still never been but really need to get there! I swear you must have some type of market radar goggles to find such cool stuff! how come i never see any great stamps for sale??? Neat idea - just goes to show what imagination can do. The baked bean stamp is so useful ! Not too sure why just yet ....but it will come to me soon .Meanwhile I covet it . but it left us enough time to spot some nice art and have a lovely Sunday afternoon! I will remember this one for the markets I will explore in France in two weeks.